I will have been at Microsoft for 6 years this fall. What an incredible journey I’m on. When I first joined, Bing was Live Search and was a totally different organization. It was a lot smaller. I think back then we could not even be called underdogs—Live Search just was not relevant. The progress we have made in the last few years has been nothing short of amazing. We have overtaken Google in some key areas, and the future is nothing but positive for us. I have been working on the same team almost since I joined (I had two months on a team that was reorganized) and I could not have been luckier to land where I did, right in the heart of the query serving pipeline. Since then, we’ve gone through some major redesign efforts and pushed out some amazing pieces of software to drive Bing (and many other parts of Microsoft). I became extremely familiar with .NET performance, and that has been key to my own personal success and that of my team’s. The challenges remain, and always will, which is a good nothing. This entry was posted in Bing, microsoft, Personal on July 16, 2014 by Ben. If you write managed code, you want this book. If you have friends who write managed code, they want this, even if they don’t know it yet. 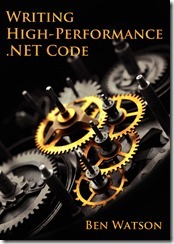 Do you want your .NET code to have the absolute best performance it can? This book demystifies the CLR, teaching you how and why to write code with optimum performance. Learn critical lessons from a person who helped design and build one of the largest high-performance .NET systems in the world. See http://www.writinghighperf.net for up-to-date information about the book. You can also like the Facebook page or subscribe to this blog to see updates. The book is currently available via Amazon and Kobo. Barnes and Noble is pending. More retailers and formats will follow. See the Buy page to check for current availability. I will also be posting some blog entries with topics inspired by the book, but weren’t quite a good fit. This entry was posted in Books, Link/News, microsoft, Software Development and tagged .net, Books, performance, programming on July 14, 2014 by Ben.